challenge and here are our showcase choices! This is so clean and simple... and a super, pretty little creature takes centre stage. Neet's little ladybirds really pop, a super CAS card! 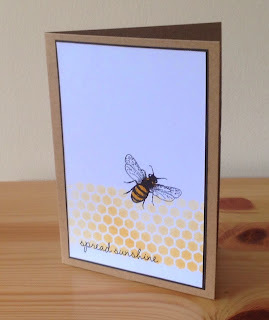 Such delicate inking on this background and a beautifully coloured bee, fabulous! What an adorable dog... so simple... so super! What wonderful examples. Please take our ShowCASe badge for your blogs. We love seeing your inventiveness each week. Do come back tomorrow for another challenge... it should be fun! Here are some of our cards for this week, there are more examples on each designer's individual blog. Do have a look at all the examples, you can click on our names which will take you to our blogs. with 2 Clearly Besotted Standalone Butterfly dies!!! Due to a (hopefully!) 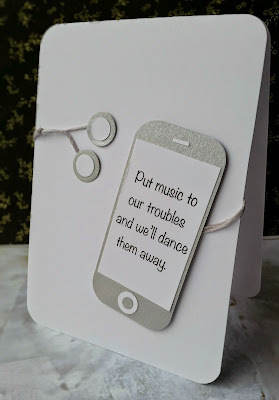 upcoming move, I've had a ruthless cull of books, but Pinterest came to the rescue with a free printable page that I used. 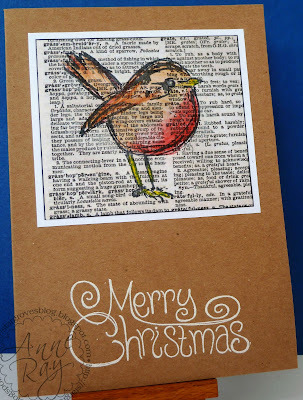 I've stamped a Dina Wakely scribbly bird onto it (new acquisition thanks to winning a Simon Says Stamp voucher) and coloured with Inktense pencils to make it a robin. The white embossed sentiment is Paper Artsy. I began by stamping an Impression Obsession 'fill the page' background stamp of distressed newsprint onto some ivory paper in Basic Gray ink. 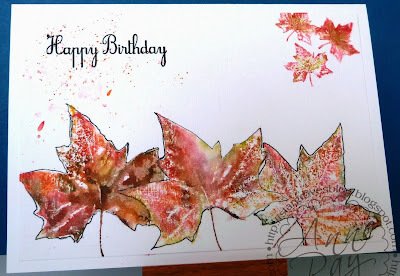 A leaf stamp from Clearly Besotted's Autumn Flowers set was inked with three shades of Distress ink. Shabby Shutters to begin with, then a little Peeled Paint around the edges of the stamp and finally a touch of Forest Moss around the extremities. 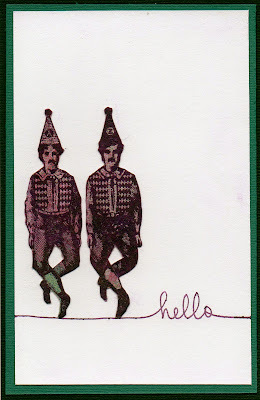 This was stamped onto the newsprint background, in the orientation I wanted for the finished card. The leaf was then die-cut with the matching die and layered with three other pieces of die-cut card to add a little dimension. 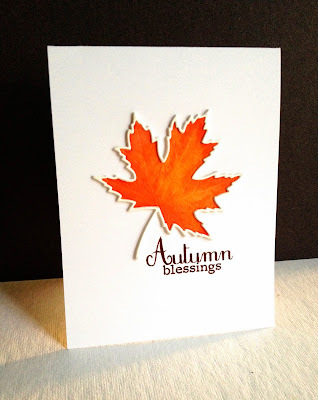 The embossing folder is Adagio from Couture Creations and the sentiment from Stampin' Up. A few tiny pearls were added in a little cascade to complete it. We're sure that you must have lots of innovative ways of using newsprint in your creations, we can't wait to see. As ever we really would like to encourage you to visit a few of the other participants in this challenge to leave a friendly word. Here are the fabulous cards chosen for our One Layer ShowCASe this week. What a vibrant pair of little penguins! What fabulous colouring on these jolly jingle bells! Perfect placement, superb composition and wonderful colouring. Just couldn't resist Viv's cute robins. Well done everyone, please take our ShowCASe badge with our congratulations! Another fun challenge starts tomorrow so do come back to join us! We don't mind how little they are... cute, cuddly or creepy we'd just like to see something small! Here are our cards this week. The stamps are from Impression Obsession, a set I picked up in a sale bin at a craft show once, I think the ladybirds are cute! The grass tufts are from a tiny Art Impressions stamp. can't remember where I picked it up from. bakers twine, gems from my stash and glossy accents. 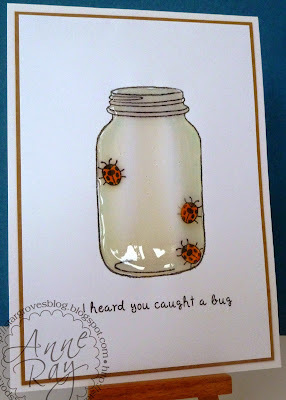 Ladybugs and jar are Alysinkyfingers stamps. I computer generated the sentiment as unfortunately the one that came with them had a typo in it. The jar is lightly coloured with Copics and given a good dollop of Glossy Accents. Please remember to keep your submissions Clean and Simple... last week a few entries were submitted without taking note of the focus of the challenge... some were not one layer, some with no reference to 2 of something and others not CAS. 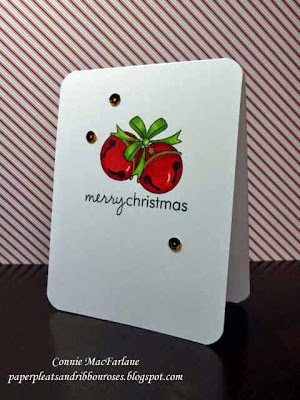 It seems easy for crafters to see a brief outline of our challenge on Paper Playful and then simply submit their cards without actually reading any of our blog post. In fairness to those who always follow the challenges implicitly, if your submissions do not adhere to our guidelines, they may be deleted. 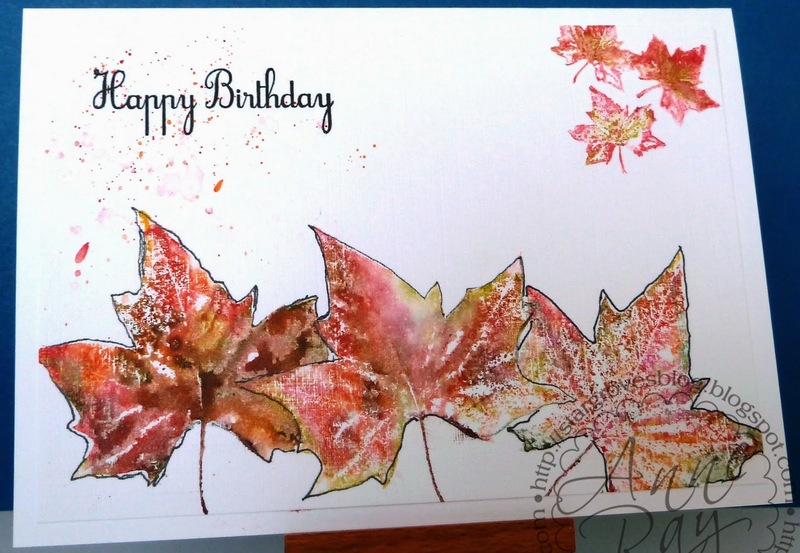 We love how the leaf colours are echoed in the corner of the card! Look at Heather's wonderful colouring and fab CAS design. 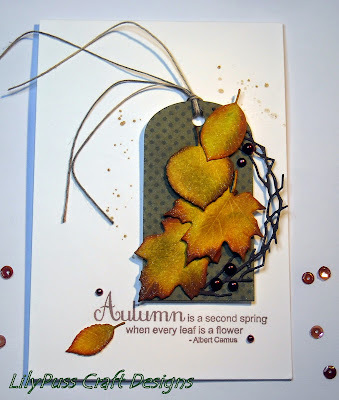 Jan's stunning creation is breathtaking... wonderful leaves and such imaginative use of the wreath die! What awesome simplicity, those wooden elements are a perfect touch! Lisa's work is a constant source of inspiration! We just had to have a few extras this week as there were SO many wonderful entries to choose from. Here is the badge to add to your blogs with our thanks! Please come back tomorrow for another fun CAS challenge! there were some really interesting cards submitted. 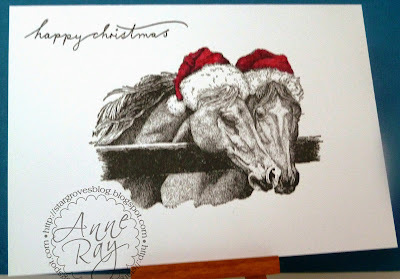 The sentiment really grabs the eye on this beautiful card. What subtle colour choices! More die-cutting, with terrific use of DP! These are all simply wonderful. Here's our ShowCAse badge for you with our congratulations! Come back tomorrow for another challenge... it's your favourite this week! 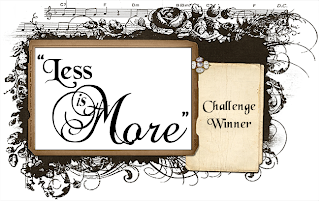 We are delighted to announce the winner of our challenge for September. If you will let us have your contact details Maarit, we'll pass them on to Uniko, so that they can organise your prize.. Here's the winner's badge for your blog! well not so much new, as back with us again. 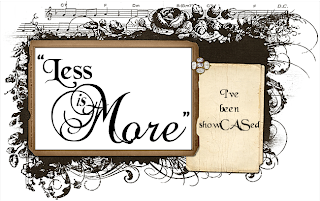 We're sure that you'll agree that Stephanie produces the most amazing range of stamps and dies and we are delighted to welcome her back as a sponsor to Less is More once again. If you haven't yet discovered her amazing products, click on the link and take a peek, you won't be disappointed. so we'd love to see autumnal shades in your cards. Don't forget to make them CAS of course! Darkroom Door leaf stamp coloured with Lyra Aquacolour crayons and then misted with water. Used a Pigma pen to outline the individual stamps, which were masked. I inked a piece of card with some Distress Inks (Peeled Paint, Wild Honey and Vintage Photo) using sponge daubers and overlapped the colours somewhat! Then I die cut the leaves and inked a little more around the edges of each one with one of the darker shades, just to give a little definition. The backdrop is simply swiped with a little watercolour (distress ink), using a fairly large paintbrush. Being totally unhelpful, I'm not sure of the origin of the sentiment stamp but the dies are from Cheery Lynn. The latter are a sort of pinky purple colour! If anyone is all over this kind of thing please let me know. We all have extra examples on our personal blogs so please pop over and visit us there to see them. We love to have visits too! The trees in the UK are just beginning to change colour, let's hope we have a wonderful display again this year. this week has been selected by Anne. Hannelie always treats us to fabulous designs and often offers free sentiments too, as was the case for this challenge. 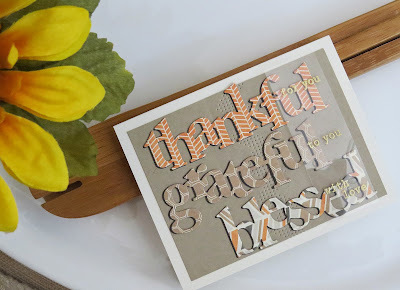 Do pop by her blog and leave a friendly comment... you could also help yourself to this super sentiment. What a wonderful creation this is... super CAS and really imaginative! Anne loved these chaps doing their little dance! Here is our badge for you, with our thanks! Another fun challenge awaits you tomorrow, so be sure to drop by and join us again! We're waiting to see you!